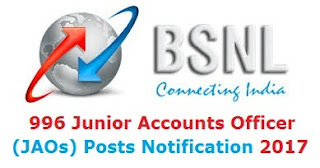 Bharat Sanchar Nigam Ltd. (BSNL) recruits about 996 Posts of Direct JAOs (Junior Accounts Officer) from open market/external candidates through ONLINE COMPETITIVE EXAMINATIONS-2017. Wide publicity in this regard has been given through the indicative advertisement by all the Telecom Circles on 10th Sep 2017 and through www.externalexam.bsnl.co.in from 10th Sep 2017. The online registration shall commence from 11-09-2017 and shall close on 15-10-2017.